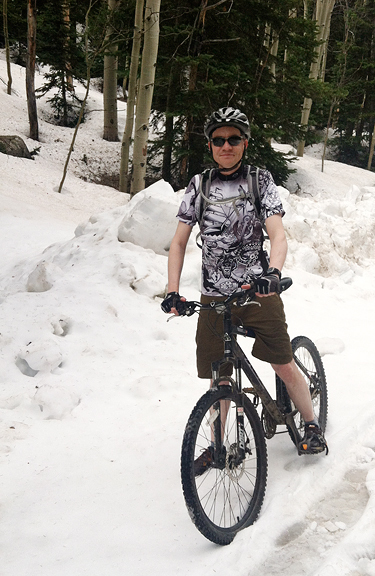 It’s nice right now in the Colorado Rockies. The pine pollen has yet to begin (I’m preparing myself for the allergy onslaught) and snowline continues to recede to higher elevations. More routes are accessible by foot or by bike, but I suspect there is still good skiing to be had further into the backcountry. 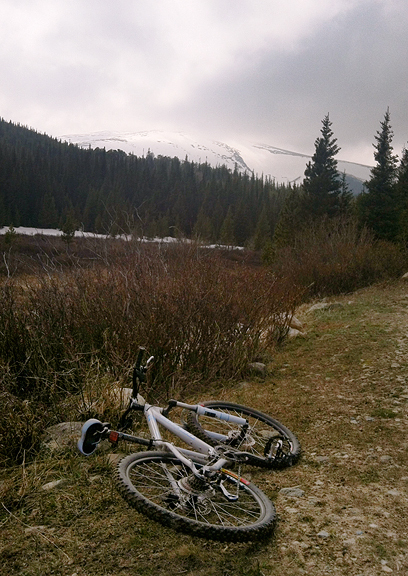 In the past week we’ve been able to ski, trail run, and mountain bike in our “backyard”. The best exercise is the kind you love to do. I’ll admit that I don’t love running, although I’m warming up to it. But I love being on trails! Trail running is one of those things that involves some pain – the running, but so much awesome in terms of solitude, beauty, time for thinking, and scouting opportunities for all things foraging (just don’t trip while trying to scope out mushrooms). 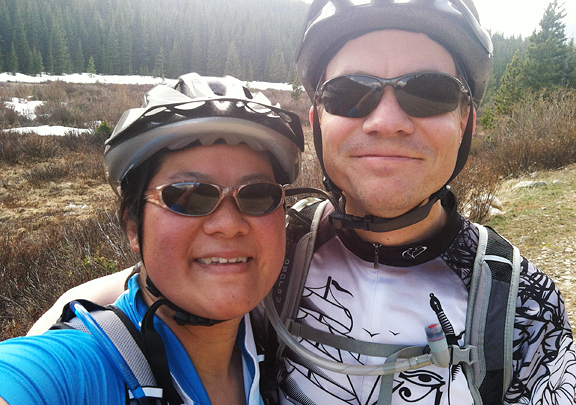 Jeremy and I start at the same time, but we run different routes that meet up an hour or two later. He runs faster, farther, and higher than I do, but then he is training for a longer and more grueling goal than I am. The most common question Jeremy gets asked by our friends who read this blog is, “How do you not weigh 300 pounds? !” He weighs half that. Jeremy is not a muscle-bound dude. He’s lean, trim, and fit. And while I don’t ply him with fatty and sugary desserts 24/7, I worry even less about his occasional sweets consumption in the service of use real butter now that he’s trail running in earnest. After yesterday’s run, I reminded him that he was required to move the tiramisu in the refrigerator, because I needed the space. The most labor intensive part of the whole thing is whisking the egg yolk mixture for 6 minutes over a simmering water bath. I stand on a stool at the stove so that my arm can whisk at a natural angle rather than lifting it high. That’s a good arm workout! If you are concerned about raw eggs (I am not), measure the temperature of your whisked egg yolk mixture – it should be safe from salmonella at 160°F. Six minutes or so will get you pretty close to that temperature. It should thicken and leave a ribbon when you pull the whisk out of the bowl. Don’t worry if the ribbon doesn’t hold for more than a second – it will thicken up more when you remove the bowl from the water bath and set it on ice to cool. What presents the greatest problem for me in making tiramisu is sourcing lady fingers. It isn’t something that I find regularly stocked in stores around here. Typically in years prior, if I didn’t find them, I didn’t make tiramisu. These days, my instinct would be to make the lady fingers myself if I couldn’t find them in the stores. Thankfully, I had a stash in my pantry (because I hoard ingredients). Some folks insist the ladyfingers ought to be soft and spongy, like cake. Others want lady fingers to be hard and crisp, like a biscuit. I like both, but I have to admit that I prefer handling the crisp cookies when assembling the tiramisu. If you use the hard cookies, dunk each one in the espresso and layer them in the bottom of your pan. If you use soft ones, layer them and pour enough espresso to soak them. The thing I love about the hard cookies is that eating a slice of tiramisu within a few hours of assembly will sometimes reward you with a little crunchy bit. It’s kinda awesome. You don’t have to pipe the last layer of mascarpone filling, but if you do, keep in mind that it requires more filling than just spreading a third layer. Finish the top with some cocoa powder or grated chocolate. I have made tiramisu both ways in the past and I prefer the cocoa powder, because it’s less sweet and because it’s less messy. That said – you know grated chocolate is also going to be amazing. You really can’t go wrong. It’s tempting to serve the dessert right away, but I find it benefits from sitting in the refrigerator for a day to let all the flavors meld and to allow the mascarpone filling to firm up and reduce shearing when you serve a slice. This recipe easily doubles, triples, quadruples. Make huge pans of it for large parties or gatherings, or make a single batch for intimate gatherings or to share with people you love. What I love about tiramisu is how it doesn’t require the use of an oven (unless you bake your own lady fingers). It’s also dreamy, creamy, boozy, caffeiney, kissed with a hint of chocolate, but without being overly sweet. 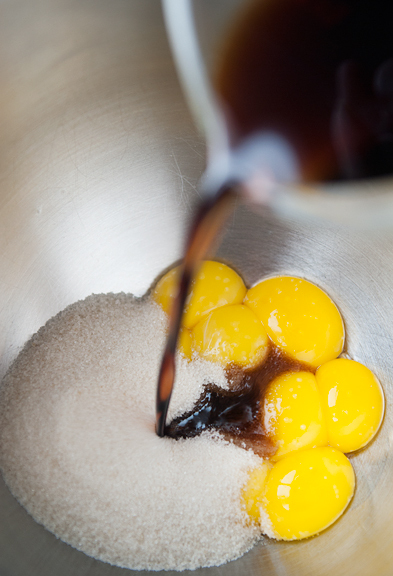 Make the filling: Place the egg yolks, sugar, Kahlua, and salt in the top of a double boiler or a large bowl set over a simmering water bath. Whisk the contents constantly for 6 minutes until it becomes thick and leaves a ribbon on the surface when you lift the whisk out of the bowl. For egg safety, the temperature should reach 160°F. Remove from the water bath and set the bowl on ice to cool. Stir it occasionally. 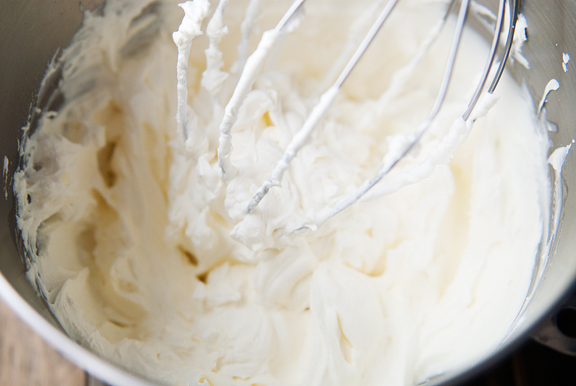 In the bowl of a stand mixer, stir the mascarpone cheese and the cream together, then beat with the whisk attachment until stiff peaks. 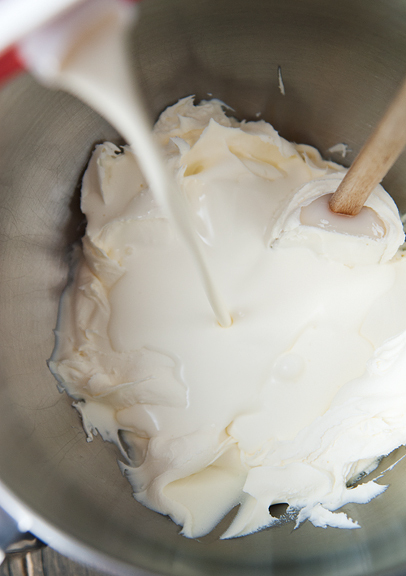 When the egg mixture is completely cooled, fold the whipped mascarpone and cream into the egg mixture a third at a time until smooth and uniform. Assembly: Dip one lady finger at a time into the espresso and arrange in a single layer on the bottom of your pan. Spread a third of the mascarpone filling over the lady fingers. Dust the top with cocoa powder or grated chocolate. Repeat for the second layer. 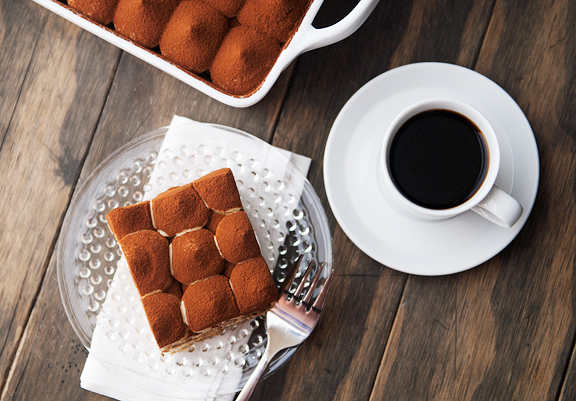 For the third layer, dip the lady fingers into the espresso and arrange them in a single layer on the tiramisu. 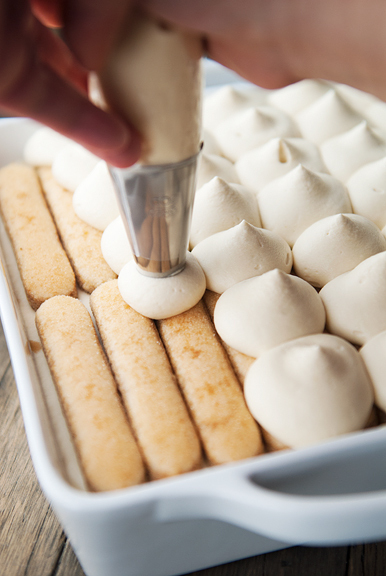 You can either spread the remaining third of the mascarpone filling or pipe it decoratively over the lady fingers. Dust with cocoa or grated chocolate. 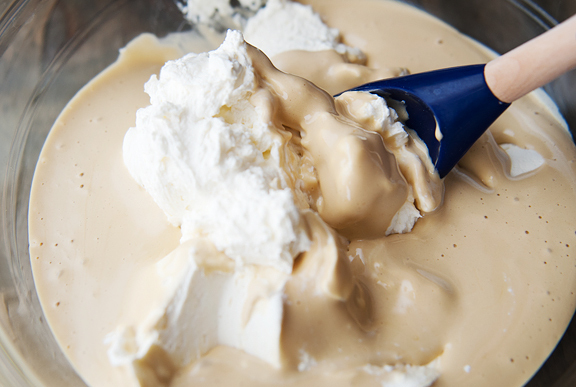 Refrigerate for 24 hours to let the flavors meld and for the dessert to firm up. Serves 8-10. LOVE your little piped dollops of cream. So pretty without being too fussy. This is so pretty! What a great idea to use a piping bag for the mascarpone! what a bunch of gorgeos pictures of this nice tiramisu, i am searching for a long time for a recipe i like and i will definitely try this!!! I’m not into coffee, but you decorated this tiramisu so beautifully I would have a very large slice, Jen! 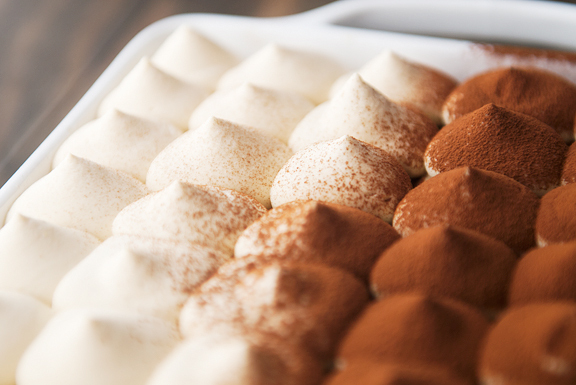 Love tiramisu, and this looks GREAT. Just made your roasted strawberry ice cream & can’t wait to eat some tomorrow. My daughter was all, “Roasted strawberries? Hmmm…better make some raspberry swirl ice cream too, in case we (she, her dad & brother…NOT me) don’t like the strawberry.” Well, she thought it tasted pretty darn good when she helped me make it. Beautiful. This is art, defined. How could it not be? Coffee amidst a cloud of happiness and cuddled by a biscotti. OMG! 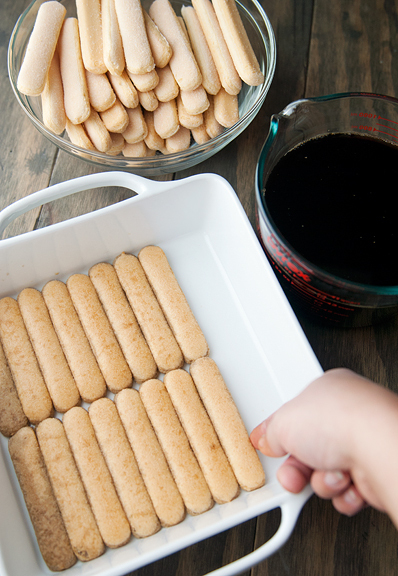 I am so eager to try this using a true biscotti, rather than the traditional method of the ladyfingers. OMG, x’s 2, the flavor combinations are whirling about my grey matter. Almond. Candied orange. Anise? I don’t know, but one thing I do know, once again you have inspired me. I hope o be back to my kitchen soon. OMG!!!! I can taste it from here!!! Heaven! Thanks. O.M.G.!!! Exactly….that looks AWESOME! Thank you so much!!! That is by far the prettiest tiramisù I’ve ever seen. I would do just about anything to be the one biting into that slice right now! I was a tiramisu addict about 10 years ago, soured on it, and I recently found out that I still love it. I might just make myself a pan this afternoon, thank you! Sooo beautiful!! I’ve made this a few years back, but I found it sooo rich that I could eat about a spoonful without being full. Maybe its time to try again! Hi Jen, This is a novel and impressive a recipe for tiramisu with a beautiful presentation! I live in boulder and am wondering if you got your savoiardi locally. I looked for them a few months back but couldn’t find them anywhere. Thank you for the recipe! i’m drooling at my screen LOL, looks so easy that i’m going to make it this weekend! 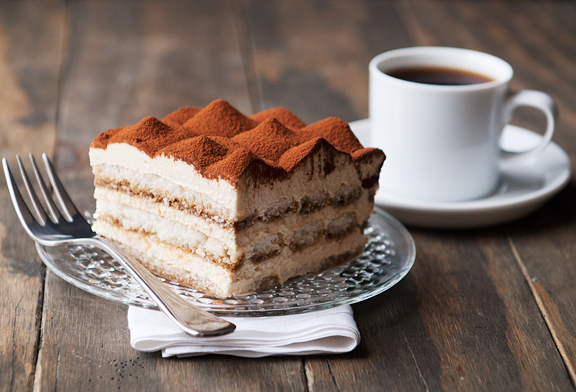 All I can do right now is pretty much stare through my screen at your tiramisu and sigh. 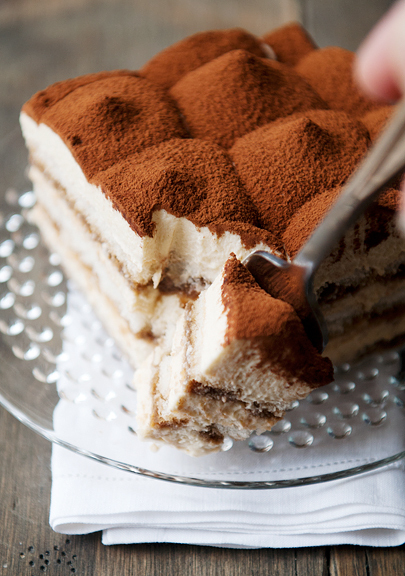 And of course, wish that the next time I whip up tiramisu I have enough patience to make it look as stunning as yours. That’s so pretty! must try! Why have I never made this? Probably because all I’ve ever had is mediocre tiramisu in restaurants. This is the opposite of mediocre. It looks incredible. Your photos are so beautiful. Must find some ladyfingers! Kristin – ha!! Glad you’re teaching your daughter to have an open mind about food! CoffeeGrounded – Kaweah sends wags. Robin – I bought these savoiardi back in December. I think I got them at Whole Foods. It’s really hard to source around here. However, you CAN order them online from Amazon if you can’t find them anywhere. The guy at Trader Joe’s told me they only carry them around the holidays. Sherry – yes, try Amazon if you can’t find them locally. Hi there, this is wonderful!!!! What size piping tip did you use? Gia – I believe it was a 3/4-inch plain tip. You can also make your own Savioardi-type cookies! There are plenty of recipes online, and it was part of an old Daring Bakers’ challenge. 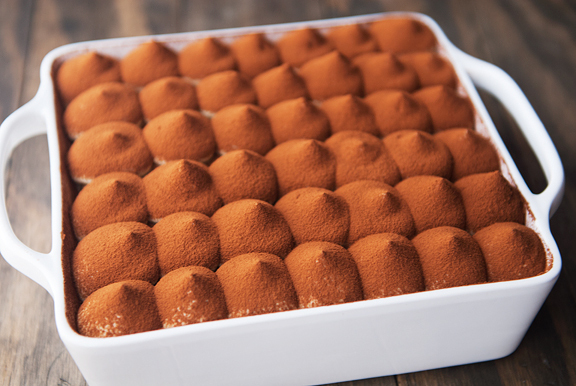 Anyway, your tiramisù looks incredible! It is the prettiest one I have ever seen! Love the piping. Just referenced your Site on my Blog (Pottery with Food). Your Tiramisu recipe the BEST! And love following your Blog!! I just made this and everything turned out amazing. However, the bottom part of my lady fingers were very soggy and had a lot of liquid from the espresso. All I did was dip them in the espresso for a spilt second. Any suggestions on my next go around to prevent them from becoming so soggy? I tried it out yesterday and the result was really yum. The only issue i had was that the cream was very liquid. The mascarpone mix was great, but i guess the egg mixture was not stiff enough…or is there any other reason ? Rachel – Perhaps just dip the bottom half of the lady fingers in the espresso and then turn them dry-side down? Mine soak up a lot of espresso too. I also find that if I refrigerate the tiramisu and serve it the following day, everything is a lot more “solid” and less soggy. Sofia – I think you probably need to beat the egg mixture more. It takes quite a while before it thickens, but it eventually does. Also, make sure it is cooled. If it is hot, it will likely melt the mascarpone and cause the whipped cream mixture to deflate a lot. Do you mean two regular cups of espresso (16 oz) or two espresso cups (4 oz)? Emily – yes, 2 cups as in 16 ounces. You wind up using quite a bit. Se ve TAN delicioso. Lamento que mi inglés no sea lo suficientemente bueno para escribir en él. Haré esta receta póximamente. Saludos desde Argentina y éxitos con las carreras. i was wondering what size tip you used? How did you cut it so nicely? I am amazed at the clean cut. When you remove the egg mixture from the heat do you fast or slow cool it? Hi, I made this last night and had a question. I whipped the whipping cream with the mascarpone, and got it to stiff peaks. I cooled the egg mixture on ice until it was cool (not warm at all) and then worked on folding in the mascarpone mixture 1/3 at a time. It took quite a bit of folding as it was chunky and not smooth at all. Eventually I got it smooth, but by then it was not fluffy anymore at all. I tried piping and it was a big creamy mess. I haven’t tried cutting it yet (having it tonight) but do you know how I can fix this for the future? Hello, is it regular heavy cream or heavy whipping cream you use? Your cake looks FABALOUS! Looking forward to hearing from you so I can make it this weekend. Thank you! Sarah – I cool it quickly if it is winter on my deck, or I’ll set it on a bowl of ice. Michelle – I think that if you work the mascarpone whip too much, it will deflate the air bubbles and then become too runny. But I wonder if it would help to fully chill the egg mixture in the refrigerator just to be sure that no warmth melts the mascarpone and whipped cream? Did it eventually firm up? Chilling it will make the topping more solid. 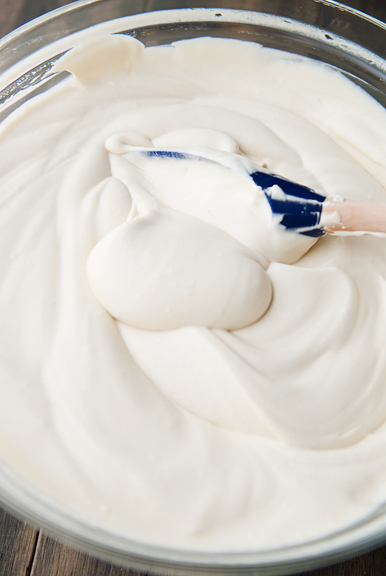 rowmac2000 – heavy whipping cream. Mine thinned out after folding as well and still had small clumps, I transferred it back into the mixer bowl and whipped it on medium for about 30 seconds and it smoothed out and fluffed back up. Hi Jennifer, I made this yesterday and it is delicious! However, my egg mixture did not look like your pictures when I was cooking in the double broiler. I used four eggs like in the written recipe but then when I looked at your pictures I noticed there were six eggs. I forwarded the recipe to a friend and she is a better egg counter than I am and she thought they were eight eggs in there. How many eggs do using this recipe? Thanks so much for posting this recipe. Whether it’s four eggs or eight, it is delicious! Do u have a suggestion for a substitute for the kaluha like imitation rum or ameretto flavor? Trisha – I don’t have a suggestion, sorry. You could try googling a substitution. Thank you, Jennifer! Yes, I meant double boiler. And no, I certainly have not gone thru almost 40 years of living saying and thinking of it as “broiler” with an “r” even though that makes no sense. Nope, not me! Oy…. thanks for helping me see the light. :-) And thanks for the clarification on the number of eggs – as I whisked them they thickened up to a paste within one minute, so I’m wondering what was different. Temperature topped out around 150. I didn’t use Kahlua brand, but rather a homemade Kahlua that a friend gave me, and I don’t know what the ingredients were, but maybe something in there contributed to the weird behavior. On a side note, I put the coffee into a squeezy water bottle, laid down the ladyfingers, and then squeezed the coffee onto them that way. That helped them not get totally soaked – in fact they probably could have used more coffee on them, as I did end up with leftover coffee at the end. Thanks again for this awesome recipe! Did you cool the espresso before dipping the ladyfingers? Thanks! brenda – I don’t think it matters either way, but I dipped when the espresso was hot (and burned my fingers). Looks like an awesome recipe, can’t wait to try it. I am wondering what do I need to do if I dont use kahlua, our family is strictly no alcohol. Sadia – maybe try making a coffee syrup to add in its place? Love this! It’s so rustic but so beautifully styled – I never thought to neatly pipe mascarpone on the top. But according to the amount of your ingredients given and the Pictures shown , I would say they do not match. I followed your steps but I had a different result.? Ralf – yes, the photos show that I doubled the mascarpone filling. The recipe amounts should be sufficient, but if you want to pipe the top the way I did, you will need to double the mascarpone filling. Hope that helps! I am making this today and was wondering if it need to be covered when you chill it over night. Would it also be best to put the cocoa on just before serving. Thanks a lot and I hope mine comes out all beautiful as yours. Jessica – yes, do cover it or the top will get dried out and gummy. Yes, cocoa just before serving works best. Also, if you are piping the mascarpone topping like I did, you will want to double the mascarpone part of the recipe because it will look sparse otherwise. Good luck! Thanks for the quick response Jenyu! I have it made and all assembled, covered in the fridge. Just some pointers for some of the questions above. I am non-alcoholic too so I make a coffee simple syrup. 1/4 C espresso, 1/4 C sugar simmer until very thick and bubbly. Take off the heat. Then I put a little imitation rum extract, probably 1/4 tsp. Then I stirred about a Tbsp. of heavy cream in. It was great! Then when I was cooking the yolk mixture, I did double it, it took a bit longer that 6 min to ribbon for me. Just a suggestion for those who said their final product was too runny. It’s probably better to go longer until it ribbons. Really whisk it up too. Mine turned out looking darker that the pic but that’s probably due to the homemade Kahlua. 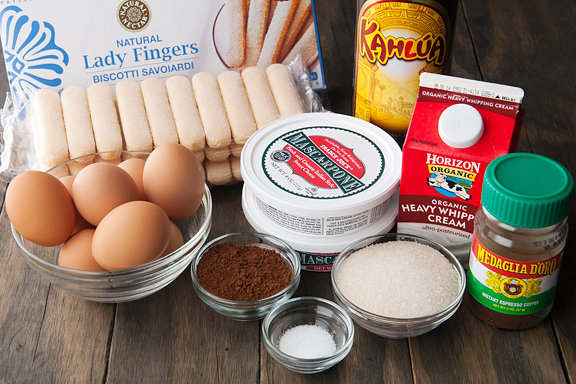 So a few years ago I made tiramisu and I found ladyfingers near the Safeway bakery. This time I didn’t see them so I ended up looking everywhere. I finally looked by the pasta at king soopers. There’s an specialty Italian section right there and I was so happy to see them. They were also a great price. Hope that helps anyone. Also, Trader Joe’s carries DELICIOUS Ladyfingers, in case anyone is having trouble finding them! 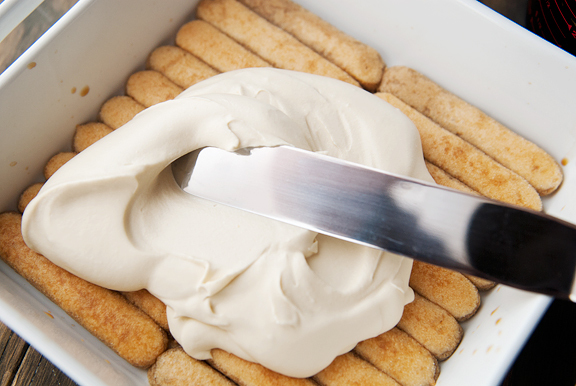 Did anyone ever try THIS recipe with toffuti and Rich’s RichWhip? I need to be dairy free for the lactose intolerant family but dont want to give up on the egg yolks/zabaglione because I think it’s kind of essential. 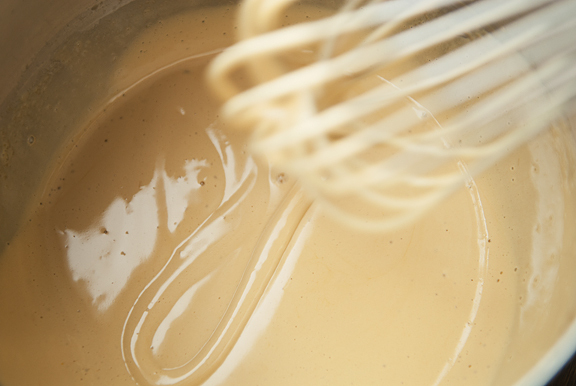 My fear is mixing the egg zabaglione with the toffuti/rich whip. I’m going to try it but does anyone have any idea if this will work? Sort of a combination of Jen Yu and Michael Berkowits? This has got to be the most beautiful tiramisu I’ve ever seen. I can’t stop looking at those plump little piped domes covered in cocoa. I desperately wanted mine to look like this, but I think American heavy whipping cream might hold up better than regular whipping cream. I’m currently in Sri Lanka so any whipping cream is difficult enough to get – might try it when I’m back in Australia later on in the year. I made this for my family for thanksgiving and they LOVED it. Thanks for sharing!! I always thought it was so hard to make! In your picture it shows 8 yolks why in your ingredients it says 4 yolks? Inin – Because in the post I said I doubled the recipe. I have been making tiramisu using this recipe for a couple of years and always get so many compliments. Best tiramisu ever. Thank you!